The homeowner at 2336 24th Avenue tried to blow cayenne pepper through the kitchen exhaust fan and into his attic, Broadview Fire Chief John Tierney said. "He used a leaf blower to try to spread (the pepper)," Tierney said. "It got caught up in the hot motor of the exhaust fan. There were (also) rags up there in the attic." AN obese motorist arrested after a drunken rampage denied resisting police, claiming he was too fat to get out of his car, the Brisbane District Court heard today. 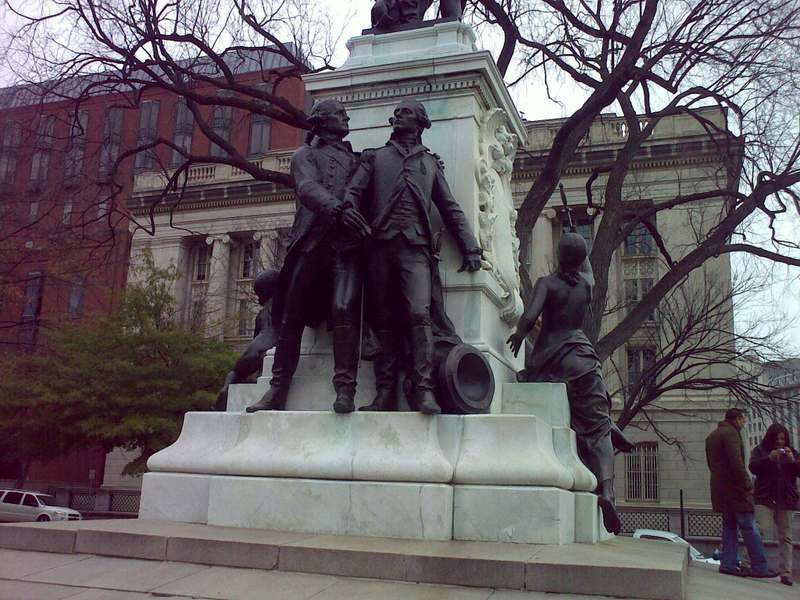 Bob was concerned that Norm seemed attracted to the naked lady around the corner holding the sword. 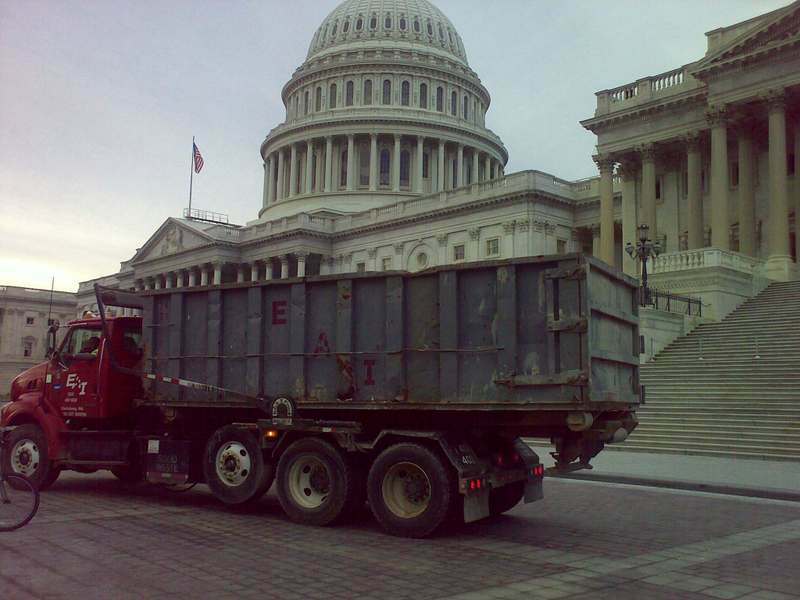 All day long, trucks such as this one pull up to the Capitol to dump loads of taxpayer dollars so Congress can give them to large needy financial institutions. ...for the Spontaneously Combusting Teatowels. My family and I celebrated Thanksgiving in Washington, D.C., at the home of Mr. Gene Weingarten, of the Washington Post. Among the other guests was Mr. Joel Achenbach, also of the Post. 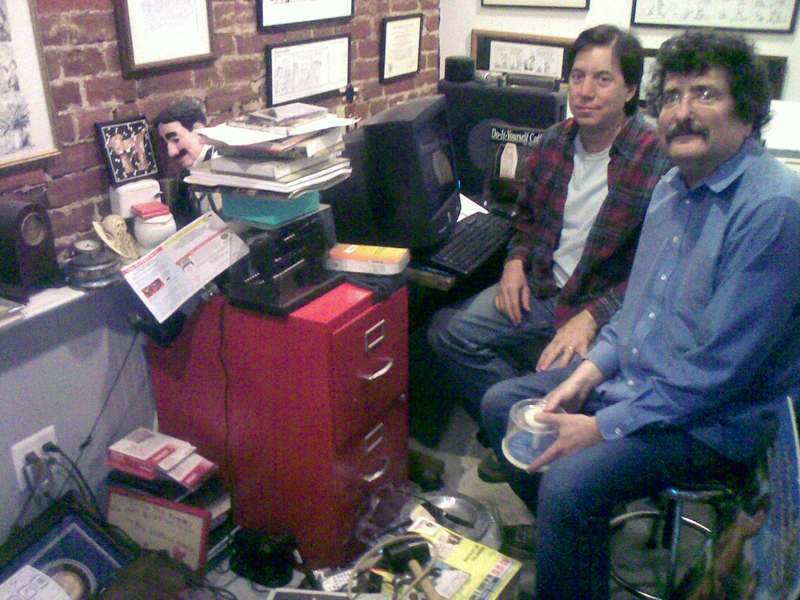 I took the CrapCam photo below of these two legendary journalism professionals in Gene's basement office, which apparently has been struck by numerous freak basement tornadoes. I'm pretty sure Jimmy Hoffa is in there somewhere. A man who says he eats 10 Mars bars a day has claimed a lack of sugar prompted him to attack his girlfriend when she wore big, Bridget Jones-style knickers instead of a G-string, a British court has heard. Key Quote Describing Detective Work: In that incident, Velasco-Rivera threw a bag of chicken parts into the backyard of the residence to distract a barking dog. After tracing the bag back to a Mini-Super Store, Dalton detectives were able to obtain a surveillance image of the man who purchased the chicken parts, which was released to the media. Three Norwegian tourists came under fire and one was shot after the satellite navigation system in their car guided them straight into one of Rio de Janeiro's most dangerous slums. Key Quote: The students say they initially planned to hang bed sheets, but had trouble collecting 350 sheets, so they moved to undergarments. UPDATE: We have been notified that this item is not only old, but also it has already been linked to TWICE, and as a result judi was fired. Rest assured that she will be rehired specifically so she can be fired again. A man tried to rob a Florida convenience store with a palm frond. A JAPANESE man has been arrested for releasing hundreds of beetle larvae inside a moving express train to try to scare female passengers, police say. "I wanted to see women get scared and shake their legs,'' police quoted 35-year-old Manabu Mizuta as saying. If you can make it there, you'll make it anywhere. A pedicab with a pole dancer. Lap dancing "is not sexually stimulating", the chairman of the Lap Dancing Association told a parliamentary committee today. THINKING ABOUT HIRING COLLEGE STUDENTS TO DO YOUR WEBSITE? Key Quote Indicating Alertness of Clerk: The clerk noticed the man was wearing men's underwear as a mask and replied, "You gotta be kidding," police wrote. 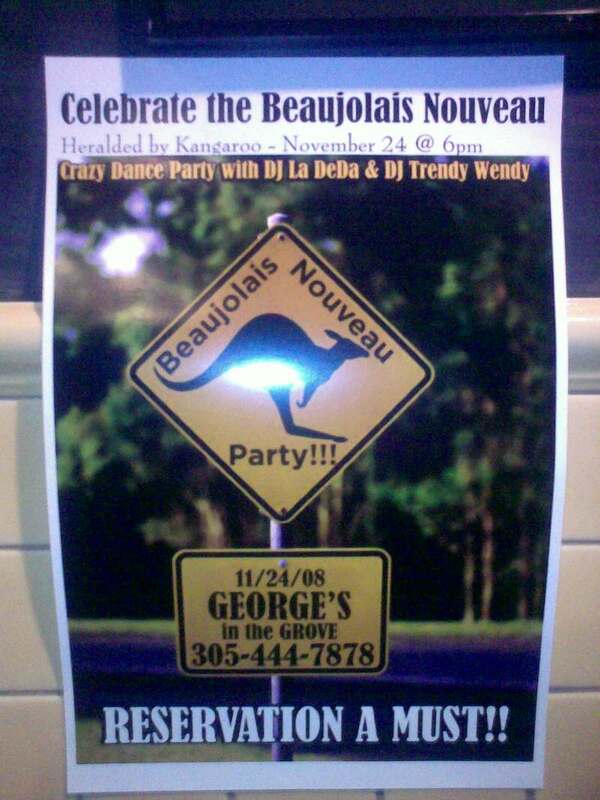 There is an old saying in my family, passed down through the generations, and it goes like this: "If you have an opportunity to witness the Beaujolais Nouveau heralded by kangaroo at a crazy dance party with DJ La DeDa and DJ Trendy Wendy, you do not pass up that opportunity." And so last night we went to George's, where there were in fact three kangaroos -- a mom, a dad, and a baby -- heralding the Beaujolais Nouveau, which they did mainly by standing around looking nervous. The staff was dressed in (Why not?) Australian garb; George himself was wearing what I think was supposed to be an aborigine outfit, probably from Big Norm's Aborigine Outfitters. 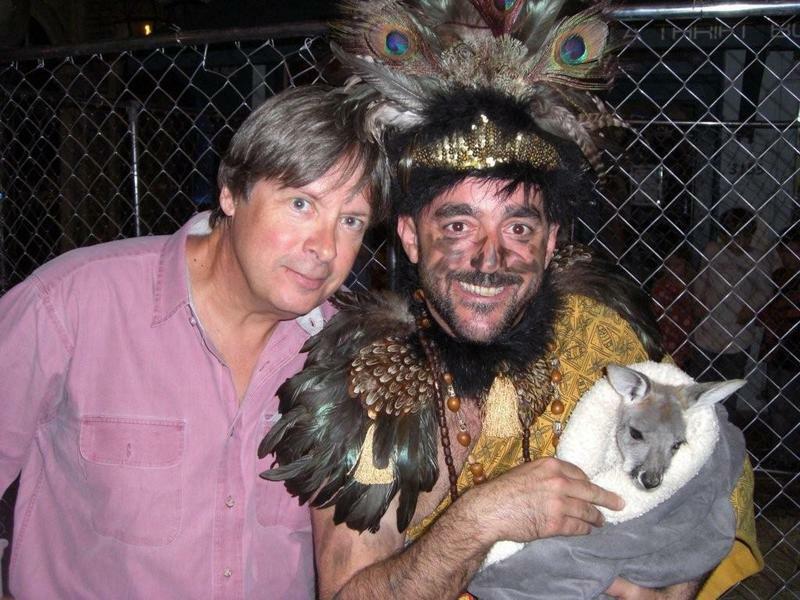 Here's an exclusive photo of me, George and the baby kangaroo. Shortly after this photo was taken, the 'roo tried to bite George, and I don't think anybody blamed it. ...we would observe that today is Jeff Meyerson's 60th. Imagine my surprise at opening up Google News this morning and seeing the following headline: "Guard fatally shoots man with sword at Scientology church" (Los Angeles Times). My language question is: can a guard fatally shoot someone with a sword? I thought one could only shoot a sword to wound. Or would the fact it happened at a Scientology church have an impact on the conjugation of the pronoun? A. It was probably an assault sword. A snowboarder gets some serious air. Perhaps someday you'll be able to bring your hamster. Somehow, in all the election excitement, we missed this.